The aftermath of the collapse of civilization has an honoured place in science and speculative fiction. 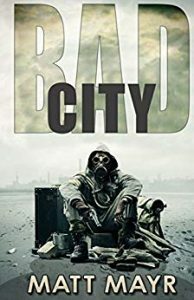 Born into a brutal post-apocalyptic landscape, violence, death and isolation is all Anton Vargas has ever known. Returning to North Town, he seeks revenge for the murder of his brother, and act that he hopes will provide some sort of redemption, and extinguish the long-burning hatred he’s carried for so long. Matt Mayr grew up in a small mining community north of Lake Superior, where he learned to hunt and fish from a very young age. He holds an Honours English Degree from York University, and attended the Humber School for Writers mentorship program twice. He has traveled extensively in India, Nepal, and South America, trekking to Mount Everest Base Camp, and paddling deep into the Amazon Basin. He lives in Toronto with his wife and daughter, where he is working on his next novel.